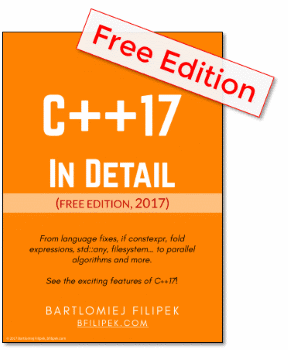 The new C++ Standard - C++17 - is near the end to be accepted and published. There’s already a working draft, and not that long ago it went to the final ISO balloting. It’s a good occasion to learn and understand what are the new features. Trigraphs are special character sequences that could be used when a system doesn’t support 7-bit ASCII - like in ISO 646 character set . For example ? ?= generated #, ? ?- produces ~. BTW: All of C++’s basic source character set fits in 7-bit ASCII. The sequences are rarely used and by removing them the translation phase of the code might be simpler. More details in: N4086. If you really need trigraphs with Visual Studio, take a look at /Zc:trigraphs switch. Also, other compilers might leave the support in some way or the other. Other compiler status: done in GCC: 5.1 and Clang: 3.5. The register keyword was deprecated in the 2011 C++ standard as it has no meaning. Now it’s being removed. This keyword is reserved and might be repurposed in the future revisions (for example auto keyword was reused and now is something powerful). This operator is deprecated for a very long time! In C++98 is was decided that it’s better not to use it. But only in C++17, the committee agreed to remove it from the language. In C++17 exception specification will be part of the type system (see P0012R1). Still the standard contains old and deprecated exception specification that appeared to be not practical and not used. The above code is deprecated since C++11. The only practical exception declaration is throw() that mean - this code won’t throw anything. But since C++11 it’s advised to use noexcept. This is one of my favorite update to the language! If you need help with the conversion from auto_ptr to unique_ptr you can check Clang Tidy, as it provides auto conversion: Clang Tidy: modernize-replace-auto-ptr. In the linked paper N4190: there are also other library items that were removed: unary_function/binary_function, ptr_fun(), and mem_fun()/mem_fun_ref(), bind1st()/bind2nd() and random_shuffle. We can argue what is a fix in a language standard and what is not. Below I’ve picked three things that sound to me like a fix for something that was missed in the previous standards. To make this happen, we need to understand two ways of initialization: copy and direct. More details in N3922 and also in Auto and braced-init-lists, by Ville Voutilainen. Already working since MSVC 14.0, GCC: 5.0, Clang: 3.8. Self-explanatory. It allows just to have the condition without passing the message, the version with the message will also be available. It will be compatible with other asserts like BOOST_STATIC_ASSERT (that didn’t take any message from the start). As you can see, __begin and __end have the same type. That might cause some troubles - for example when you have something like a sentinel that is of a different type. Types of __begin and __end might be different; only the comparison operator is required. This little change allows Range TS users a better experience. Next time we’ll address language clarifications: like guaranteed copy elision or expression evaluation order. So stay tuned!